Many thanks to Soham Sarcar for this article. Soham is the cofounder of Transhuman Collective. Transhuman collective (THC) is a collaborative project where multi disciplinary aesthetics and expressions often merge with technology to produce multi sensorial Live experiences. THC designs these experiences for Art, Events & Brands through Projection Design, Interactive technologies, Augmented Reality, Performance Art, Sound Design and Traditional Art Installations. Infact THC is one of the leading and the foremost group of New media Artists and Designers in the country who are experimenting with 3D Projection Mapping,Installations, Interactive/Performance Art and have multiple commissioned projects to their credentials. Mumbai Makes Me Happy was the theme for the MCHI CREDAI 2013 Property show. We wanted to create an interactive experience for the visitors based on this theme. Some of the most identifiable elements of Mumbai like the growing Infrastructure, Ganesh Festival, Dahi Handi, The Dabbawala and Bollywood were augmented with the audience live feed. People could interact with the augmented elements in realtime. The Exhibition was the biggest ever property show in india. Immaculate planning and logistics were involved in setting up the show. 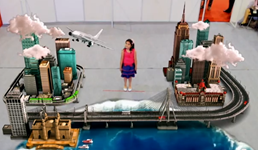 The augmented reality zone was planned 2 months in advanced. The process involved multiple recces and technical setup. A dedicated zone was created for this experience. We wanted to create the most spectacular and unforgettable augmented reality experience for the visitors and that was the one line brief given to Transhuman Collective. Something which they have never experienced. Also there are very few Augmented Reality experiences created around the world, so we wanted to push the limit and wanted this to be one of the best in the world. The main challenge was to design the 3d content and set a benchmark. One of the sequence where the audience creates the future city of Mumbai just by moving their hands was the most challenging. We detailed the whole city of Mumbai which included the Future skyline, the worli sea link, Gateway of India, CST and the monorail.